Apple Music editorial playlists are not the same in each country. Take the Festival Bangers playlist for example, an artist could be added to the US version only. 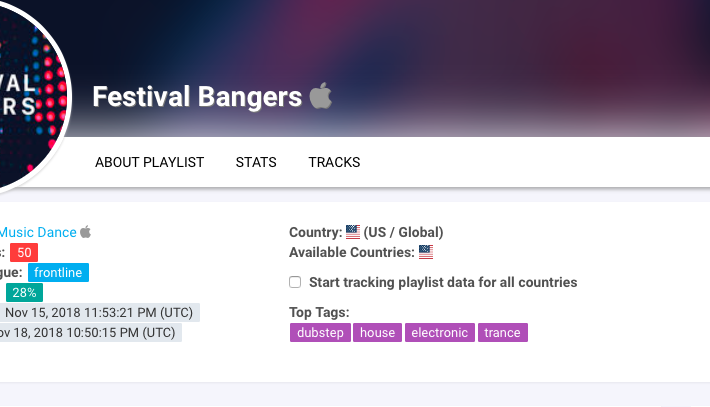 If you come across an Apple Music playlist where Chartmetric is not tracking all territories you can help us by clicking the checkbox called ’Start tracking playlist data for all countries’. Once clicked, Chartmetric will track all territories for the playlist going forward. We do not turn on this option for all playlists by default, since checking all the countries can be resource-heavy.